The most important attribute of a mall food court is variety. It’s sad when you have to say the food court at a supermarket (Market Bistro) is stronger than all of the malls we have around here. There seems to be competing trends of middle to higher end eateries popping up in malls and less people going to malls. Crossgates Mall has had a pretty sorry food court for a long time. When the Arbys closed a few years ago, it became downright abysmal. Two Chinese clone restaurants, Sbarros, Subway, Taco Bell, and Wendy’s were all we had in there for at least a few years. 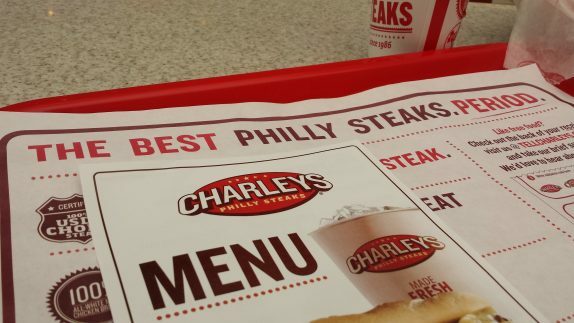 We used to have a Hot Dog Charlie’s, and there used to be a cheesesteak place that wasn’t half bad. 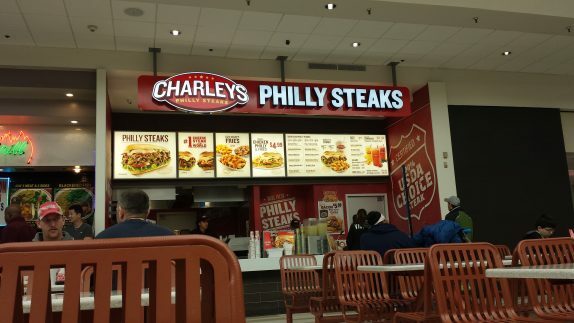 In the former home of Arby’s, between one of the Chinese clones and a jewelry shop, Charley’s Philly Steaks opened a few months ago. I had to check it out because, even though I’ve never been to Philadelphia for a proper sandwich, I’ve always been a fan of these knockoffs. 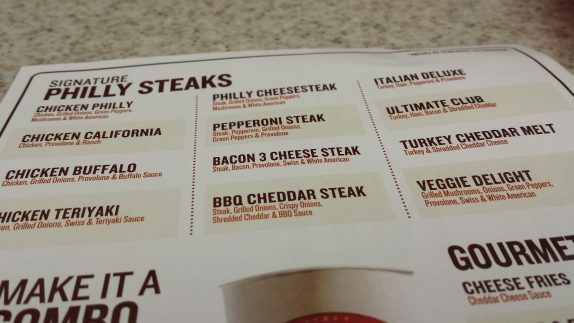 I just wanted to have their basic Philly Cheesesteak but skip the peppers (I don’t know how peppers became associated with this sandwich, but my understanding is that even mushrooms are a stretch). I went for the large, which was near $10 for the sandwich alone. 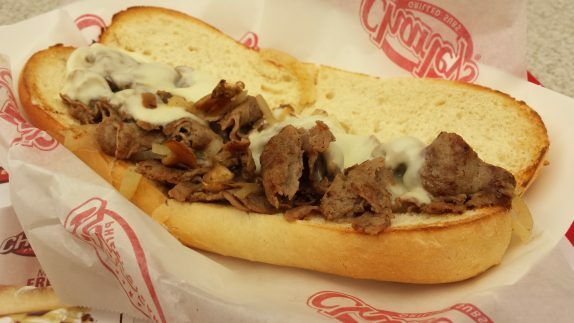 When the young man who assembled the cheesesteak was about to hand it to me, he put his hand in a bucket and lettuce and yelled, “lettuce and tomato?” to me, to which, I exclaimed, “hell no!” What kind of animal would put lettuce and tomato on a piping hot sandwich like this? 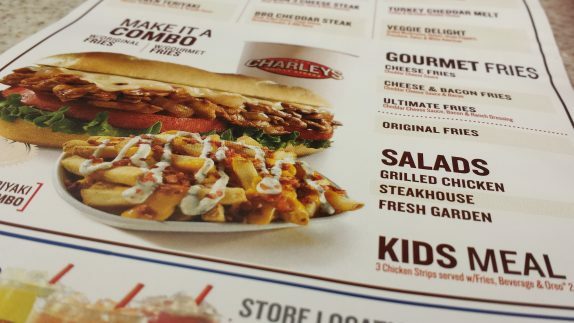 Looking back at the menu and menu board with pictures, it appears their sandwiches are filled with lettuce and tomatoes, which I find unfortunate and a little deceiving, since that’s how the volume really gets filled. The sandwich was actually really good. White American cheese worked perfectly well with the beef they use, and the sauteed onions and mushrooms provide a good bit of texture and umami flavors. 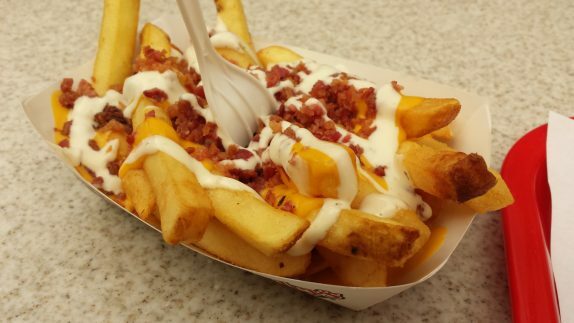 On the side, I went with a soda and their Ultimate Fries which had cheddar cheese sauce, ranch dressing, and bacon. That bumped my bill up around $15. The fries themselves were decent. I can only take so much of this kind of cheddar sauce, and even less ranch dressing. I was definitely full by the end. It beats the hell out of Sbarro or those Chinese places that force you to take a sample then give you the smallest portion ever when you fall for it.